Will it be all it's chalked up to be? 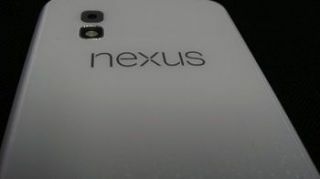 Update: The no-color Nexus 4 is looking more and more like it could really happen. A slew of photos popped up Wednesday showing even more detail...though curiously still no frontal shots to give a full 360 degree view. The screen side does look to be black like the current Nexus 4 on the market, meaning there won't be much difference between the two when looking face on. It would be nice to see it, but we've always been one to want as many angles as possible. Like a unicorn, spotting a white handset in the wild can be a magical experience. Especially if that phone is as hotly hard to find as the Nexus 4, a handset that has only today reappeared on the Google Play store in Germany, Canada and the United States. Phone Arena apparently got its hands on an image showing the whitewashed back of the Google/LG-made phone. While there's no way to tell for sure if it's the real deal, the site ran some Photoshop tests and the pic passed, lending some credence to its authenticity. The photo comes courtesy of an anonymous source and was captured using an LG Optimus G last week, which could be construed as a clue the photographer works at LG or is just consequential. Another sign the phone is the pearly partner to the slate Nexus 4 currently on the market is its reflective back pattern. Earlier Tuesday, BlackBerry's Z10 also looked to make an alabaster appearance. The touchscreen phone, due to debut tomorrow, has popped up several times in black, though previous leaks have also tipped a white version exists. The Z10 is shown with a black bezel, a stroke of design inspiration that could really set the handset apart. While an all-white iPhone is clean, it lacks the dimensionality a two-tone phone can boast. We have no idea what the front of the supposed white Nexus 4 looks like, or even if it exists at all, but so far, we like what we see.